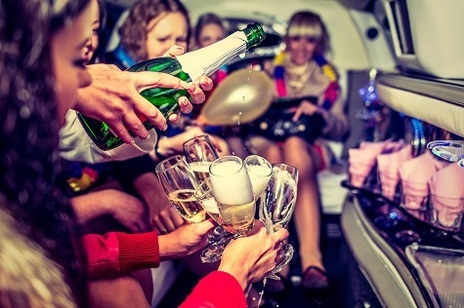 Book The Best Toronto Party Limo Bus in 3 Steps! A Party Limo Bus will make your evening special! When you want to have a great time with several of your friends without having worry about taking several cars or needing to limit your drinks because you have to drive back home then you need to get a Luxurious Limousine Bus. You will have the time of your life whether you choose to go club hopping, on a wine tour, go Black Friday shopping, or celebrate a special holiday with all of your friends. At Toronto Limo VIP we offer several luxurious limousine buses at exceptional prices. We want you to be able to not have to worry about driving and to be able to let loose and have a blast. We want you to have a memorable night that you will always remember. Most of our guests choose to take our Luxurious limousine bus again and again whether for the same events or different ones entirely. Our Party Limo Bus is the Best. You will be provided with a fashionable party limo bus decorated to your specifications. Our party limo buses are nothing shy of spectacular you will definitely have enough room to get your grove on. Our party limo buses are equipped with lighted disco floors, a disco ball, and fiber optic lighting. We have flat screen televisions for you and you guest to enjoy, CD and DVD players, and several different satellite music stations for you and your guests to choose from to groove to. We have a lot of optional choices that you can choose from including your choice of beverages you want stocked, a stripper pole, and a slide to help you get out of the limo bus easier. We have the best repetition in town and we are confident you will come to see this as well. We only have the latest and newest party limo buses making any party you book with us awesome and hip. We have a fully stocked wet bar which will make the crowd inside the party limo bus come alive. Exceptional Service. Our full service staff caters to your and your friends every needs. We are geared to meet your personal and professional requirements at excellent and affordable rates. Our professional, well dressed, and certified chauffeurs are friendly and knowledgeable of the streets that they drive on. We pride ourselves on being early ensuring that you will never be late to your event. We are a reliable luxurious limousine service in the Toronto are. With our exceptional service that we off we know that you will not in any way be disappointed. We will accommodate any and all of your legal partying requests. We Care about Your Safety. Our Toronto Limo Services adheres to the safety regulations that are required ensuring your safety. You are our top priority for our all of our staff members. We make sure that our luxury limo buses are in top-notch working conditions every time before they hit the road and we also make sure that our drivers are highly qualified and licensed as our chauffeurs. We also make sure that all of our luxurious party limo buses are filled with gasoline before a road trip so we do not have to end up stopping in a sketchy part of a city. All of our chauffeurs are routinely drug tested because we truly care about you. We go up and beyond what is required because your safety is our top priority. Unlimited Stops. We allow you unlimited stops for you and your guests to have the best day and night possible. We are here to ensure that you do not have to worry about transportation on this fun night. We will pick you up in one location or in several, then we will stop at all of the places that have been decided upon with you and our customer representative, and then ensure you and all of your guests make it safely to your destination after the partying has ended whatever time this may be. Give us a call today and ask about our luxurious party limo buses and our limo service. We know that you will have the time of your life with us. Remember to bring your camera or cell phone to capture memorable moments. This is one party you will not forget and a night you will wish could last forever.